Put away the knives and hard work, and start slicing your own fresh potatoes to create fabulous fresh French fries with the TigerChef Heavy Duty 11-Piece French Fry Cutter Set. This all-inclusive commercial grade manual fry cutter set includes all the components you will need to be well on your way to creating many popular sizes of French fries that your customers will clamor for – in minutes. Constructed with a heavy-duty cast iron body, this rust and corrosion resistant fry cutter includes a stainless steel reciprocating rod, safety shield. V-shaped trough and a manual lever that is simple to assemble and break-down for daily use, cleaning and sanitizing. Simply follow the instructions to assemble this unit in minutes, and, thanks to its durable and sturdy construction, it can reliably and safely be stationed in any food prep area of your kitchen to make fast, fresh French fries. To wall or counter mount, choose a stable, safe wall or countertop surface and drill holes the size of the screws. Then use the screw holes at the bottom of the legs to mount the unit. For added convenience and usability, you can use the secure suction cups (included) to mount the fry cutter in any convenient spot in the kitchen. Whether it’s over a cutting board or over a commercial mixing bowl, the flexibility of using this fry cutter with suction feet can’t be beat. Operating this unit is also a breeze. Simply place a potato on the safely shield in the V-shaped trough so it rests firmly and safely between the blade, pusher block and lever, and press down on the long-handled manual lever. Voila - in one swift motion an entire potato will be sliced up, so in minutes you can produce mounds and mounds of potato slices, in whichever size you choose. 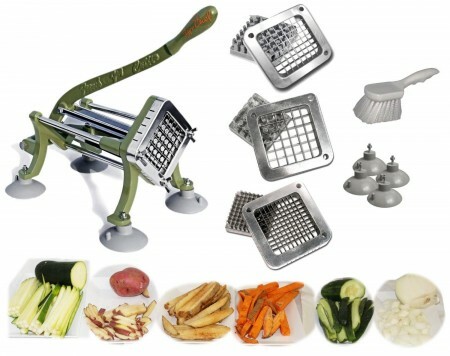 This unit can also safely be used with sweet potatoes and zucchini to create other popular and healthy menu favorites. Because this fry cutter set comes complete with a variety of blades in several sizes, and their corresponding pusher blocks, you can easily switch around the size cut you want at any time. For the most popular, 1/2” thick cut, the 1/2” blade will yield uniform and perfectly shaped fries. For the smaller 1/4”” or 3/8” cut, a size difficult to achieve by hand, using these blades will help you get those potatoes sliced up, in perfectly uniform sizes, with no hassle at all. Fully and completely interchangeable, switching between blades is a snap, as they screw on and off the frame safely in seconds. 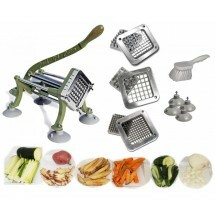 This fry cutter, including the blades and pusher blocks are also a cinch to clean. All you need to do is remove the blade and pusher block, hand wash them in the sink in warm, soapy water, sanitize, scrub them with the free cleaning brush (included) to eliminate any debris, rinse and then let air dry on a drying rack. Easy-to-use and economically priced, join our many satisfied customers who say that the TigerChef 11-Piece Heavy Duty French Fry Cutter set is the easiest way to make French fries at home or in their commercial kitchen. It is the best one I have use in our home! How long of fry can it cut? (longest end to end, 8 inches? More, less? Fits Potato Size Up To: 3 3/8" x 2 3/8"
Are the cutting blades and pusher blades American stainless steel? do you sell the wall bracket for this cutter? Yes, but the sweet potato may need to be cut into 1-3 pieces before putting it through the machine.